From 1893 until 1927 when Lizzie Borden died and was waked at her impressive home at 306 French Street, she was never truly alone at Maplecroft, even after sister Emma left suddenly and without full explanation being known. Along with Lizzie’s beloved canaries and Boston bull terriers was the constant presence of a housekeeper, which at times, must have been the only other human presence walking through the spacious halls. Maplecroft saw a parade of handymen, carriage drivers, chauffeurs, delivery and service people, and men to do odd jobs and repairs. But surely it was her housekeeper, who slept on the third floor, within easy call of Lizzie’s second floor bedroom which provided a secure and reassuring presence when winter nights closed in early. Hannah Nelson was born in Sweden on August 24, 1870, the daughter of Philomena and Phi Nelson. She was ten years younger than Lizzie, and when she came to work at Maplecroft in 1903, she was the same age as Lizzie when Lizzie was acquitted of double homicide in a New Bedford court. It would be Hannah who lived through some difficult times when Emma disagreed with Lizzie’s way of life at Maplecroft, and it would be Hannah who stayed on with Lizzie in the big house long after Emma had quitted it forever and the two sisters parted company. Hannah stayed on until her death on July 3, 1908. She died at Rhode Island Hospital in Providence at the young age of 37. Lizzie had written worried letters to friends about Hannah’s declining health and welfare, and in the end, Lizzie would be the one to step forward to tend to Hannah’s care and burial. The spot chosen to lay her to rest is located on a peninsula of land with a view of a little cove and river and to the east, a winding estuary. 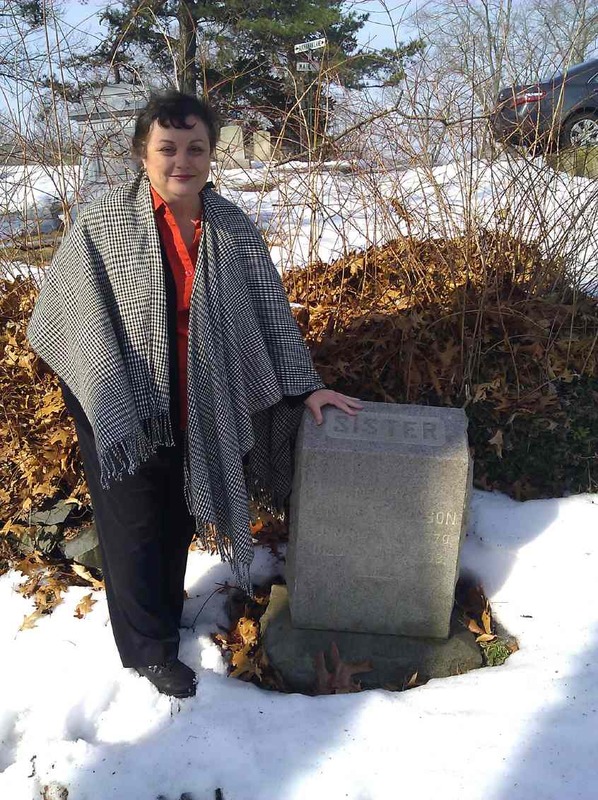 Ancient Little Neck Cemetery, in Riverside is secluded, private, and filled with fascinating historical figures of the Past. Some stones there pre-date the 1700’s, the official date of the cemetery being given as 1755. The headstone is invisible to anyone who travels down the narrow lane as it is located on the other side of a fieldstone wall, on the slope of an embankment. Only the zinc headstone of the Tillinghasts can be seen from the road above it. The view of the little estuary is Hannah’s outlook for eternity. A small child’s headstone is in the same little square plot and has names of several children, who are not related. Hers is a single grave, hidden in a secret place. 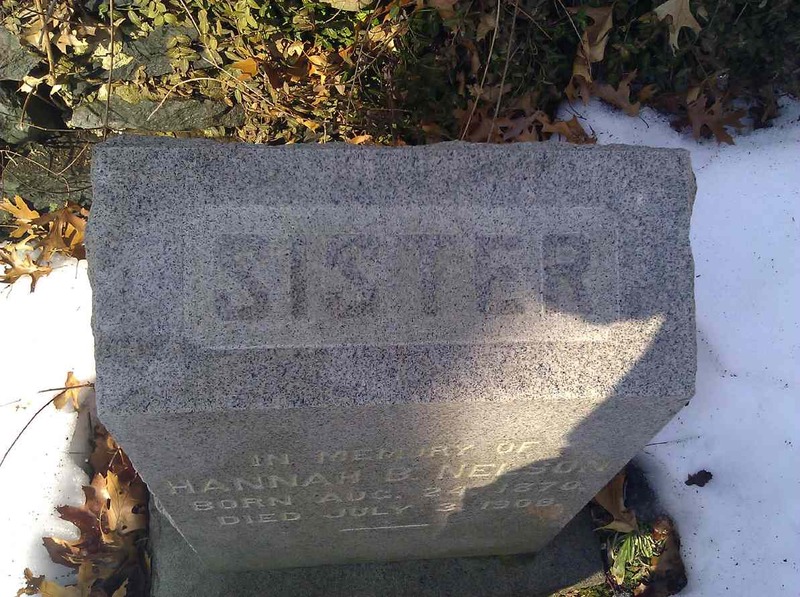 What is most memorable is the one word on the top of the stone- SISTER. The granite is of the best variety- “Rock of Ages” from Barry, Vermont. The stone is plain and unremarkable but for the one word on the top. Was Hannah like a sister to Lizzie after her own sister Emma had left? Was Hannah a companion and comfort as well as a housekeeper? Yet one more mystery about Lizzie Borden and what really transpired behind the shuttered doors of Maplecroft. 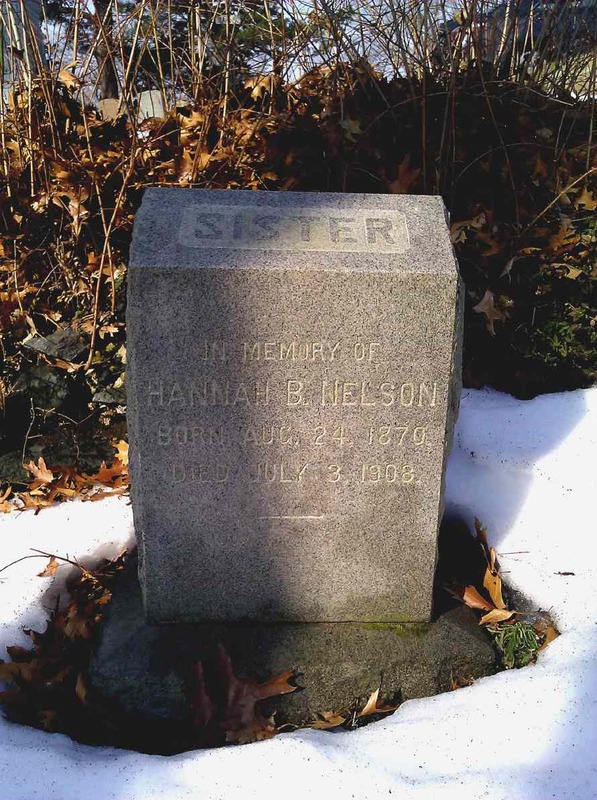 Hannah was also remembered by Lizzie in the naming of one of her beloved pet terriers, Royal Nelson, buried in Pine Ridge pet cemetery at Dedham. 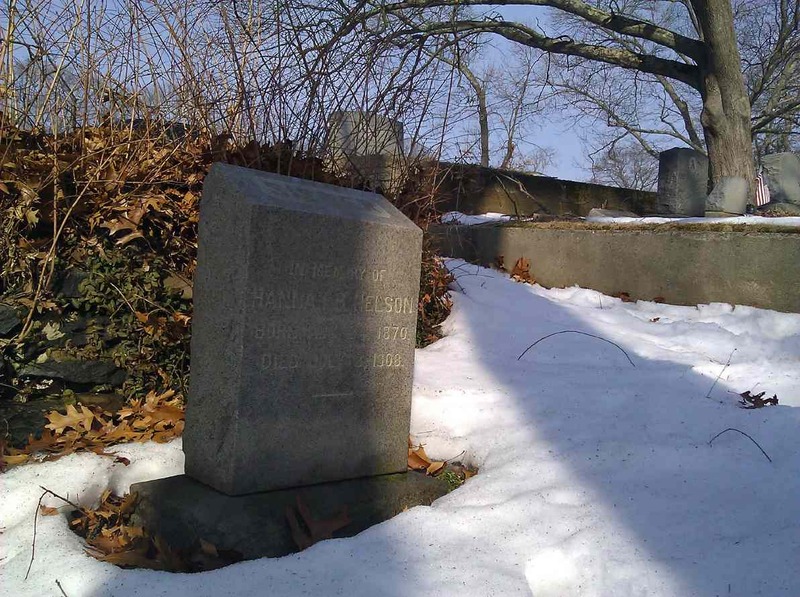 Thanks to Michael Znosko, a font of knowledge on the history of this part of the world, and a recent story http://www.eastbayri.com/detail/141281.html about paupers graves in the Ancient Little Neck Cemetery, Will Clawson (photographer), and Len Rebello (Lizzie Borden Past and Present) for assistance and biographical material. Thank you so much for this article. Shelley you always come up with such interesting information. After reading this I realize that this shows once again that Lizzie was a very compassionate person. She took it upon herself the responsibility for Hannah’s care & burial. She did not have to do this, but did out of the kindness of her heart. How many people would do this today? Shelley, what would we,Bordenians (?) ,do without your remarkable sleuthing talents and your never-ending quest for knowledge of everything Lizzie? As I have remarked before, “the more we find the more questions we have “. Thank you again for a fascinating look into Lizzie’s maplecroft life .